After dinner this evening, my wife and I took a short hike at the local preserve. We bought a very little lot out here 5 years ago and began building a little house, a project which has yet to be finished even though we are now living here permanently . About 3 years ago, we began to hear murmurings about a preserve being established, practically in our backyard. We attended a meeting to learn about the plans and left feeling pretty excited about the prospect of a 3400 acre parcel of land being set aside. All of a sudden, it really did not matter that we have a tiny lot – there is a huge playground right across the road! We have done a few hikes and trail maintenance days sponsored by the Natural Lands Trust. This evening we ran into a couple on trail who also have invested time and effort into establishing the trails. It is nice to see folks out there who we recognize. The highlight of this evenings hike was seeing two deer in the meadow. My wife picked them out in the distance. We were hoping that they would allow us to get closer, but they were pretty skittish. We hiked close to 3 miles – a fitting way of closing out summer. Tomorrow I leave for New England with a group of 29 international students for an 8 day trip. I imagine that I will have a report when I return next week! Perhaps Bash is a bit misleading – Given the average age of the attendees, I prefer to call it a gathering! 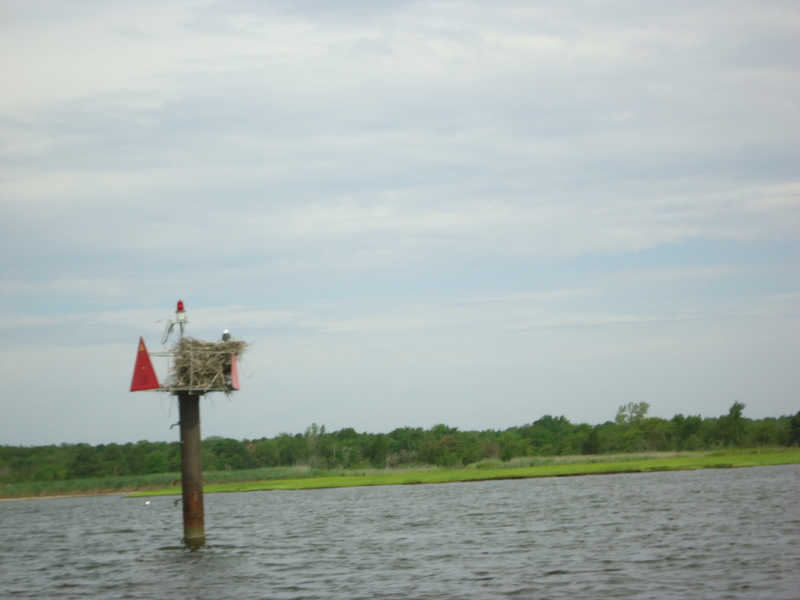 Navigation is really the secondary purpose of the day marks.. what they are really about is providing a safe place for osprey nests! We were the first to arrive at Tice’s Shoals.. So it was our duty to pick a suitable spot to anchor.. It is safe to say that there were 150-200 boats there already. So we headed towards the southern end of the throng and found a relatively quiet spot.. Our new friend, Allen from NY, was the next to arrive, followed by Bob23 – the organizer of the event. Typically, Bob would have been there on Friday night, but lightening and engine problems led to a slow trip. In retrospect, amidst all of the fun that we had, it seems that nearly everyone experienced some difficulty or another, but more on that in a bit. 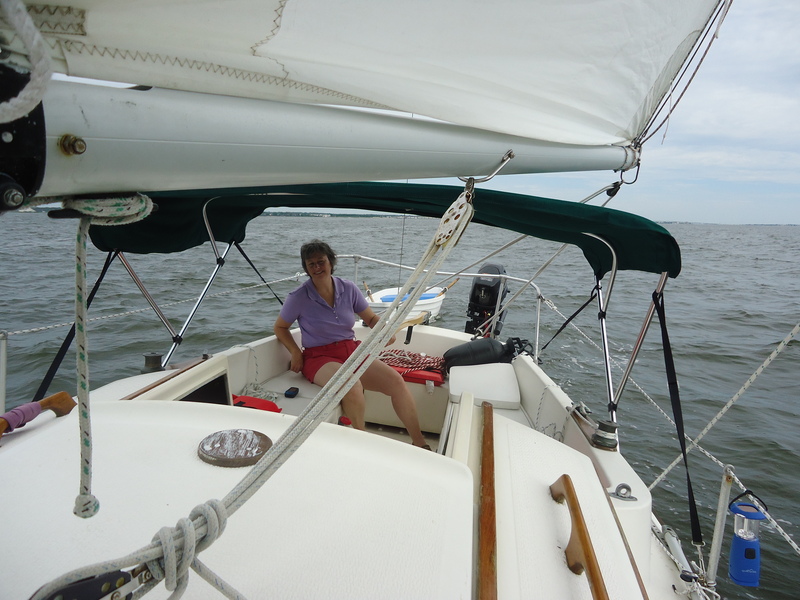 We all clambered aboard Allen’s boat and enjoyed lunch, and snacks and conversation. It was readily apparent that we were going to enjoy the time spent together. All in all, we we expecting around 8 boats to join our group. I was a bit worried that Marty had not yet made it to our destination, and my cell phone was back on Adagio, so Janet and I headed back to the boat to try to touch base with him. No sooner did we climb on board than we heard his friendly, but tired voice hail us. Janet was below when Marty came along side.. we were focused on securing his boat when, all of a sudden, Marty asked ” Why is there smoke coming from your boat”? Sure enough.. there was smoke at the transom. It was obvious from the smell that the issue was electrical in nature.. I opened the hatch containing the battery to find smoke there as well. After yelling to Janet to get out of the boat, I reached for the fire extinguisher and was able to effectively put out the fire. We opened up all of the hatches and portholes and let the smoke dissipate. I then reached down and undid all of the wiring from the battery. We spent the next hour cleaning the boat. It was somewhat coincidental when Janet picked up my book on marine wiring to wipe off the dust from the extinguisher! in fact, the cause of the issue was the line connecting the battery to the generator on the outboard. A few weeks ago it had pulled apart when I raised the engine. I later told my wife that I would never dream of leaving an exposed wire in the house – why I did not recognize that this was a similar situation – I can’t explain.. shame on me! I also find it interesting that this all came to a head just as we returned to the boat.. that was nothing less than a blessing, because I doubt that we would have made it back to the boat in time, had we noticed the issue from Allen’s boat. After catching our breath and cleaning up the mess, we headed to the beach.. Janet and I rowed the dinghy in to shore, and Allen joined us in the kayak that he had brought along. The water in the bay was quite warm. The water in the ocean was refreshingly cool! Allen and I stayed in long enough to get used to it.. janet headed back to the beach after a short time. Marty’s friend, Alex, joined our group. He sails a Bristol 24.. close enough to a Compac to allow him to join the fold! We picked him and Allen in our dinghy. Later, Bob and Marty joined us in the cockpit of Adagio for dinner and an evening of conversation. 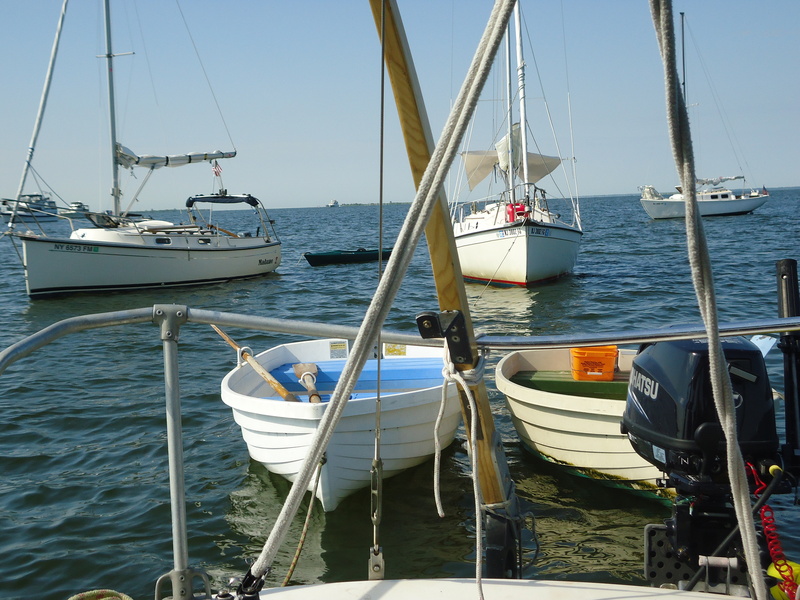 We shared dinner, and cookies and lots of laughs before, one by one, our friends returned to their boats to turn in . Marty was the last to leave. After a long hard day which included a difficult launching in the morning, he spent considerable time and effort getting comfortable on his cp 16. The wind picked up, and I was a bit concerned about how Janet would react to spending her first night at anchor, rocking and rolling.. She did quite well. It took both of us a little while to settle in, but once sleep came, it was wonderful. We awoke early on Sunday morning. The wind was still blowing, although not quite as strong. I heard what I thought was our dinghy knocking against the boat. Something did not totally make sense – with the wind still blowing, the dinghy should have been 15 feet behind us, but I did not waste a lot of energy thinking about it. Then we heard Marty declare that the sun was about to rise. I looked outside and realized that it was Marty’s boat that was knocking on our hull! His anchor dragged, and the wind shifted, and we happened to be right in line with him! I let out scope to try to correct the situation, but in no time, he was upon us again. In an attempt to reset his anchor, Marty ended up visiting most of the boats in our fleet before finally coming to rest about 100 yards downwind of us! Having a bimini makes our cockpit rather comfortable, so we all gathered for breakfast and more conversation. Well, maybe not all of us – Alex is a late sleeper, so he missed the morning gathering. We speculated as to why the other boats did not join us, but, having no information to the contrary, assumed that they simply had a change of plans. In fact, Bob’s engine problem , and our electrical issue were not the only problems experienced by com pac sailors this weekend! We later found out the two of the boats were headed towards us when they decided to take diverging courses to the shoals. One ran aground and could not start his engine. He called the other ( his uncle) to come back to assist. They ended up heading back to the marina, uncle towing nephew.. The third skipper had actually talked with Marty at the marina . He headed out into the bay just as the wind died on Saturday. Concerned about not having enough fuel to make the trip out and back under power, he headed back to the marina as well. With a 3 plus hour drive home in front of us, we sadly bid our friends, old and new, adieu and pulled our anchor. The wind was not favorable, so we ended up returning under power. 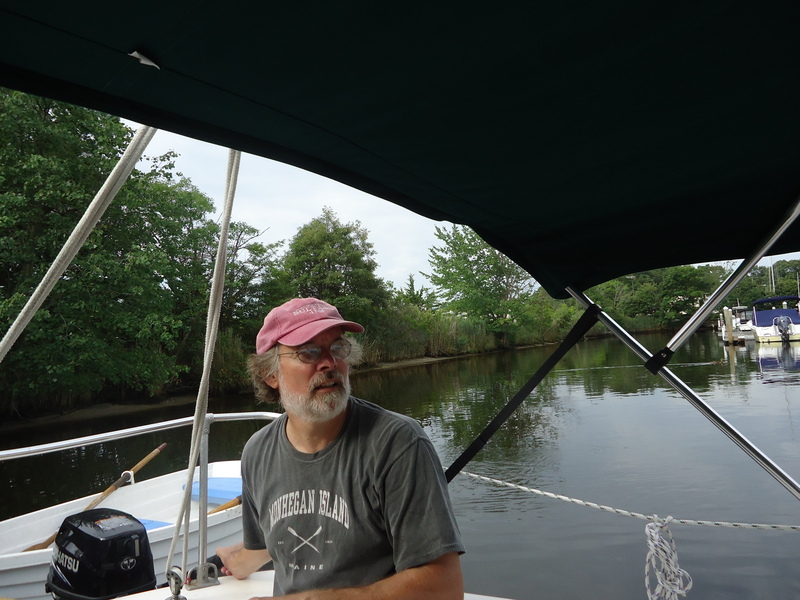 This time we decided to cut some of the corners in the channel – not a particularly risky course of action since we really only draw about 3 feet with the rudder down. Of course, having disconnected everything from the battery, we did not have our depth finder available, but that was not a big concern. The trip went smoothly for us, but we did observe a Pearson 33 run aground about 100 yards from us. I was watching the boat, sailing on a course that was perpendicular to ours when all of a sudden, the jib started flapping. One of the crew ran up to the bow and started to try to rock the boat from side to side.. Then it dawned on me what had happened.. we watched for a time as we left them in our wake. There was nothing that we could do for them with our 6hp outboard engine! I listened for a call to the tow boat, but did not hear one. They may have had the good fortune of making it off on their own! Janet spent a lot of time at the helm. She was still smiling when we got back to the marina. 🙂 I dropped her off in the dingy and brought Adagio into her slip while she rowed the dingy to the beach. We loaded the car and said good bye to the boat. We may or may not get to sail again this season. We will see how hectic the beginning of school is. I am hoping that we will get to return for one more trip during September. Not wanting to bring the weekend adventure to a close too quickly, we stopped in Quakertown ( my hometown) for dinner at a Chinese restaurant that we like. Time to prepare for a sailing trip! 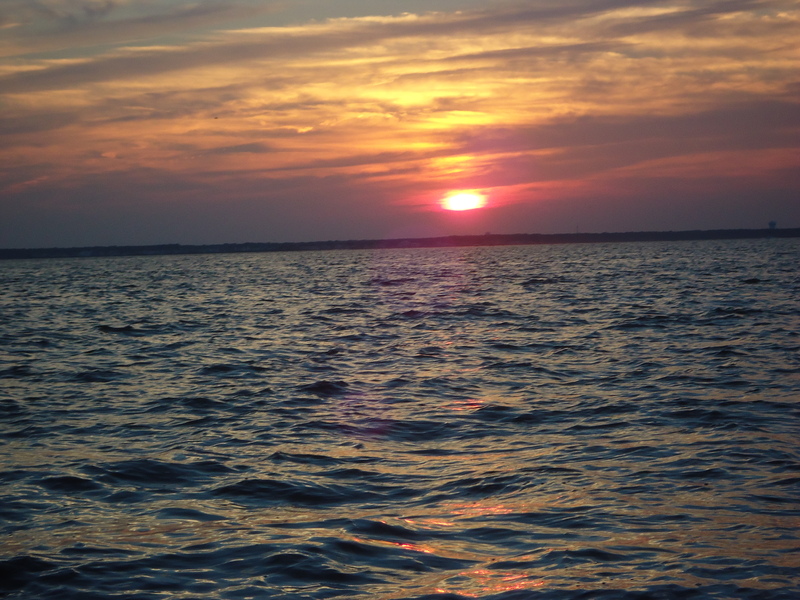 Later this afternoon my wife and I will be headed to Barnegat Bay to spend the weekend on the boat.. A good sailing trip depends on preparation! 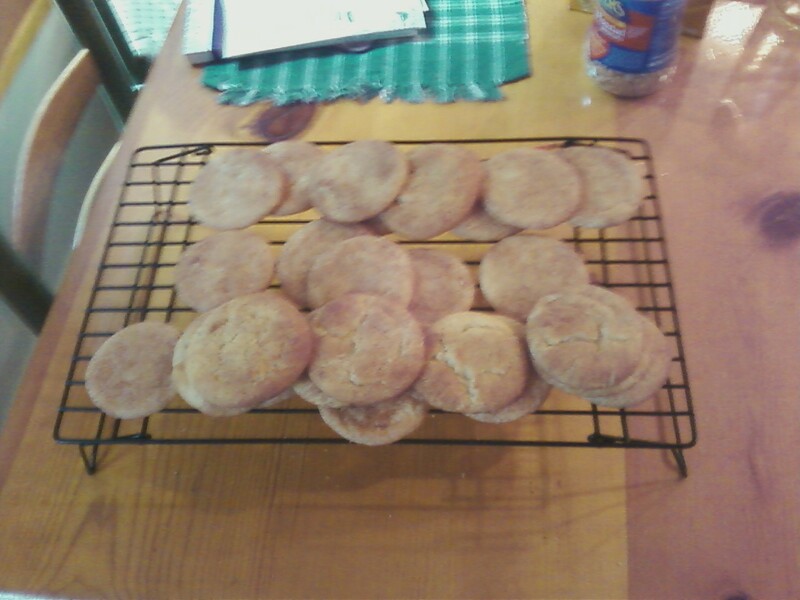 And, nothing makes for a happy trip like snickerdoodles.. This was my job this morning. 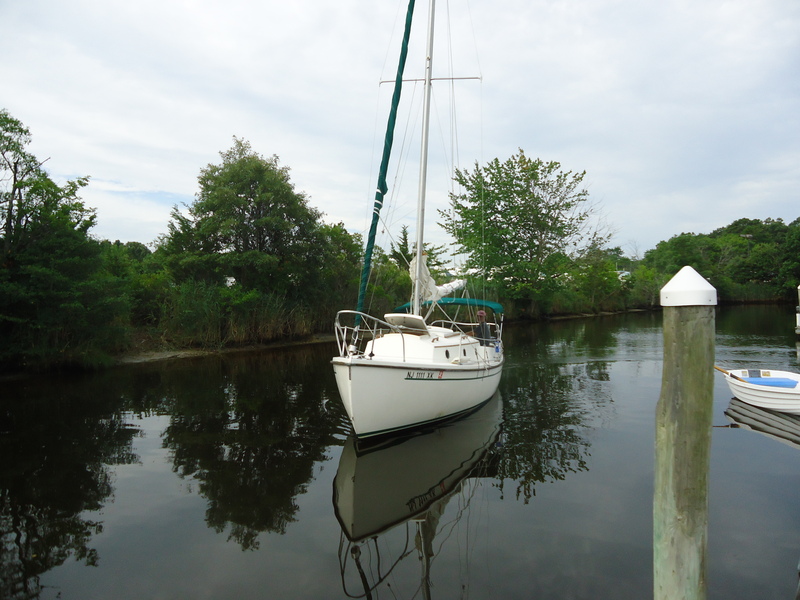 We are especially looking forward to this trip because we will be meeting up to 8 other owners of Com-Pac sailboats for a rendezvous at Tice’s Shoals. I hope that they all make it, because I baked a double batch of cookies :). Last year we had a small gathering, and my wife was not able to attend. If all goes well, this will be her first night on the boat at anchor. Although we awoke to grey, rainy skies , the sun promises to be out tomorrow.. at least for a bit. Hopefully, I will have some pics and a great report on Monday! When I was a kid, I used to think that climbing a 40 foot tree was pretty awesome! At a little over 50, I still feel confident enough to work on 12/12 roofs, and I don’t mind climbing around scaffolding, but this is not me! A while ago, I introduced my daughter, this is my son, Erik. 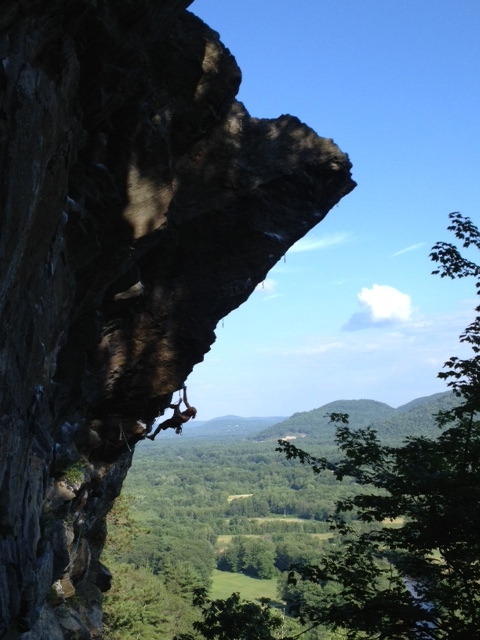 He is a guide in the White Mountains, and is fortunate to live near Rumney, NH where lots of folks from near and far gather to swap stories and climb. Erik just sent me this pic over the weekend. These are the kinds of things that parents enjoy hearing about after the fact 🙂 It is a pretty cool pic… perhaps I will have to get it enlarged so that I can hang it in my classroom this fall.. If anyone is planning a trip to NH, let me know, and I will hook you up with Erik. In addition to climbing ( year round) he would be happy to discuss sustainable agriculture and environmental issues with you! Without traveling too far, we have been treated to a variety of wildlife sightings this week.. We also enjoyed mountain pies! 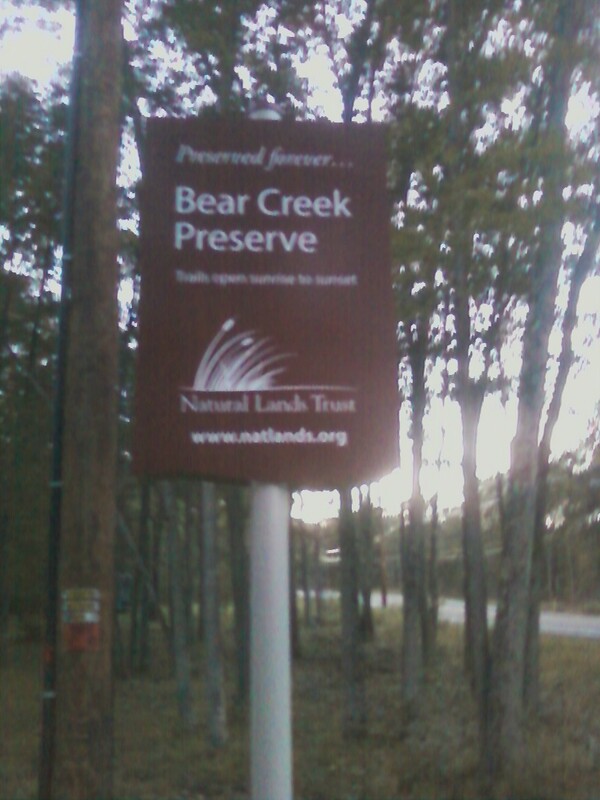 On Tuesday we did a local 4 mile walk around neighboring Indian Lake. Along the way we spotted two young deer less than 15 yards from the road. They did not have spots but they were on the small side.. perhaps they were yearlings? They were totally content to let us stand there and watch as they foraged through the thicket. And then this past weekend we went to Lackawana State Park and camped – a celebration of our 7th wedding anniversary 🙂 On Friday evening the park staff showed a movie about Eagles, and then on Saturday morning we joined a group kayak / bird watching group. We were treated to watching an osprey diving for fish along with great blue herons and various song birds. We also startled some deer who were drinking at the waters edge. On Saturday evening, a local game warden came to the park and gave a presentation about trapping and tagging bears. This is a topic of interest for us since we have had a visiting bear at our home. 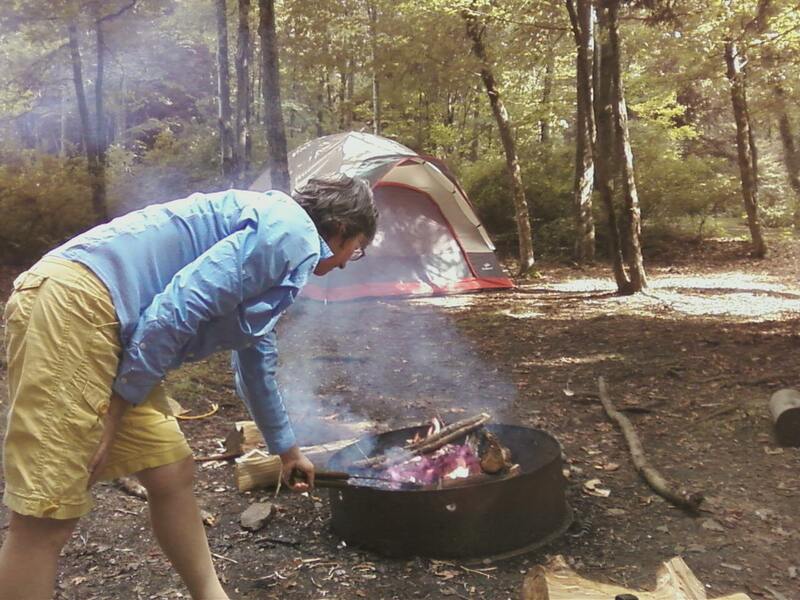 We wrapped up the camping trip with a second paddle on Sunday morning, again seeing the blue herons.. It was quite a week and a great way to spend our anniversary!